In torts, we are about to discuss animal liability and a case this week captures the liability line in such cases. 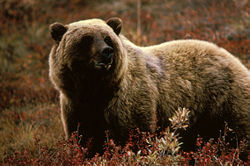 In Montana, a twenty-four-year old employee of the Animals of Montana was killed by a grizzly bear raised in captivity to appear on films and photographic images. The employee had bear spray but did not use it. Zoos are often given statutory protection to reduce the liability standard to negligence. “Roadside menagerie” means any place where one or more wild animals, including birds, reptiles, and the like, are kept in captivity for the evident purpose of exhibition or attracting trade, on or off the facility premises. It does not include the exhibition of any animal by an educational institution or by a traveling theatrical exhibition or circus based outside of Montana. Montana has previously applied negligence to cases involving injuries caused by wild or vicious animals, though the two most interesting cases are dated. In Hansen v. Brogan, 145 Mont. 224, 400 P.2d 265, a tourist was gored by a buffalo at a public resort owned by defendant. The court granted a directed verdict in favor of plaintiff on the issue of liability. The Montana Supreme Court concluded that the law of negligence was preferable and the trial court was in error in limiting the evidence of the defendant. On the date of the accident plaintiff’s family had come to [*340] Helena to attend the rodeo and had been on the grounds for some period of time prior to the accident. A Brahma bull riding event was the last event of the rodeo. Plaintiff had purchased tickets which entitled his family to seats. Before the accident plaintiff left his seat and was in a “restricted area” for some time — approximately an hour — with his three year old son. The “restricted area” was an area around one of the arena gates. While there were no obstacles or constructions to physically restrain anyone from approaching or standing in the area of the gate, there were repeated warnings by public announcement and oral warnings by uniformed security personnel. The gate was about six feet high, the same height as the fence around the arena. The Brahma bull “Yellow Fever” threw its rider; then trotted over to the gate in question and jumped on it, fell on over to the other side and landed on the three year old boy. The boy died of his injuries before he reached the hospital. The bull Yellow Fever was variously described as a “good” bull, one of our “best” bulls, a “good performer”, a “vicious” bull. An expert on Brahma bulls described them as being the “most active domestic animals”. It makes perfect sense. The father brought the family to an event know to be dangerous… Case closed. My above comment was RE the rodeo case. As to the grizzly case, how many times had the employee been where the bear could have dusted him but did not dust him? like the scorpion said to the frog at midstream “you knew what i was when you gave me a lift”. I would tend to agree with the first two comments as to whether workers’ compensation laws might shield the employer from liability as the state’s insurance benefit would provide the indemnification. I don’t know if MT is one of these states. In our state the injured must prove gross negligence or recklessness on behalf of the employer which led to the injury in order to prevail in an injury claim against the employer. I suppose there could also be an assumption of risk where the employee knew or should have know working with such an animal was part of the job description and these animals are dangerous. We can’t even figure out human motives; how are we supposed to figure out a bear’s motives? Friend of mine relates the story of his Grand Father, his family was one of the first to use horses to plow instead of oxen. A horse they had kicked an Uncle & had another incident where relation was killed….so my friend asked his Grand father if they ‘put the horse down’. Exclusive remedy is a common doctrine, but I can not claim it is universal. It was part of the compromise made during the establishment of worker compensation law. Treatment and compensation for permanent inability to work is “no-fault” in exchange for near total bar to sue employer. The remedy does not protect the employer under certain circumstances such as placing an improperly trained employee in a dangerous situation. Also there are cases where the injury was at work but not pertaining to work. I was an employer in a case of one brother killing another brother during a fight at a worksite. The family tried to bring a workers compensation claim which may have had a nuisance settlement value but was thrown out. The owners of vicious dogs are held responsible, why not the owners of wild animals? Michaelb, I live in an exclusive remedy work comp state. Are all that way? I wonder if this was the bear in the great flick, The Bear. Our adopted son had a strong love of that movie. It’s about a male grizzly who adopts a young, orphaned cub. It really appeals to kids as it is mostly visual w/ few humans in the cast. Plus, it’s one of those great movies that both kids and adults love. I watched it w/ our son ~20 times. We’ve been to Denali in Alaska and seen grizzlies up close. They have this calm demeanor that only an animal @ the top of the food chain can have. The “exclusive remedy” of workers compensation will play a part.